It's been days that I had last posted a recipe of dal. I first had the helping of sambar dal in Kolkata served as accompaniment to masala dosa in a restaurant that was famed for its South Indian meal with Uttapam, Masala Dosa, Onion Dosa, Butter Dosa and Idli topping the list. Since then I had a desire secretly nurtured in my heart that one day if opportunity came my way, I would like to try cooking South Indian dishes. My wish came true when I went to Bangalore and started working in office. Most of my colleagues hailing from different regions of South India used to bring varieties of home cooked cuisines for lunch. I happened to pick up some authentic South Indian recipes from couple of my colleagues who, like me, cherished a penchant for cooking and showed an express desire for learning Bengali fish curries. Sharing tiffin among colleagues and friends makes you aware of the endless spectrum of Indian culinary creations, each one tasting different from the other and singular in its own way. 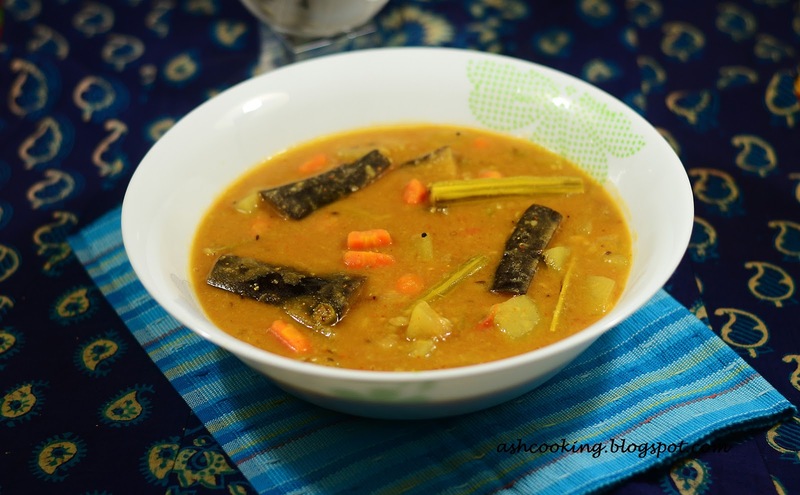 Sambar also known as Sambhar Dal is a popular Southern lentil concoction with seasonal vegetables namely, okra, eggplants, carrots, shallots, bottle gourds, pumpkin, radish and even potatoes thrown together with tamarind extract. A special powder, which is a mix of an array of spices, known by the name of Sambar or Sambhar powder is used here. For my convenience, I always rely on the readymade sambar powder easily available in Indian groceries, but if you want to take the effort of making the powder from a scratch, then note down the ingredients below, dry roast them on a skillet and grind them into powder. 2) Now heat oil in a wok. Add the ingredients for sauté and let them crackle. 3) Add tomatoes and stir around for a minute. Toss the eggplants in and shallow fry them a bit. 4) Add kashmiri red mirch, green chillies, sambar powder and salt. Sauté the mix for 2 minutes. Add tamarind pulp diluted in 1/4 cup of water. Sauté for 8-10 minutes on medium flame. 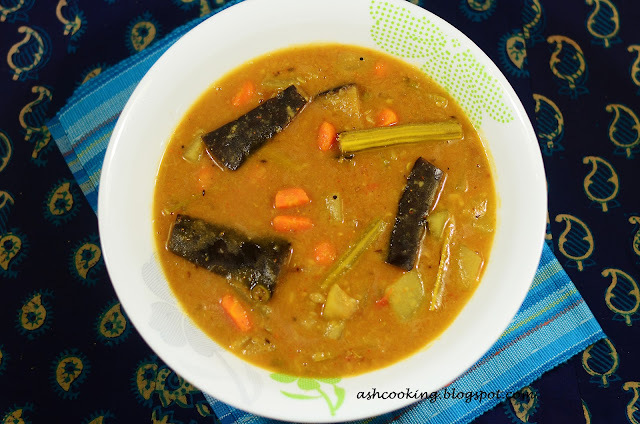 6) Serve hot with rice, dosa, bread or drink like soup.